Cookie Lavagetto's no-hit spoiler and Al Gionfriddo's famous catch are two of the most famous plays in World Series history and both are an important part of this video, which contains action highlights of the 1947 All-Star Game at Wrigley Field, the historic highlights of the 1947 World Series, and 1953 interviews with two players who had prominent roles in the 1947 Series, Frank "Spec" Shea and Dixie Walker (the "Peepul's Churce"). This full one-hour collection of rare film footage begins with highlights of the 1947 All-Star Game: Wrigley Field is packed with 41,000+ for the 14th annual game as managers Eddie Dyer and Joe Cronin have selected Ewell Blackwell of the Reds and Hal Newhouser of the Tigers as starting pitchers. In the N.L. 4th inning, "Big Jawn" Mize shatters a scoreless duel with a line shot homer off rookie Spec Shea of the Yankees, to put the N.L. on top 1-0. In the A.L. 6th, pinch-hitter Luke Appling singles off Harry Brecheen. Ted Williams then singles Luke to third with Appling then scoring to tie the game when Joe DiMaggio bounces into a double play. The A.L. scores the winning run in the 7th when Bobby Doerr singles and steals second. On pitcher Johnny Sain's wild pickoff throw, Doerr goes on to third, from where he scores on a pinch single by Stan Spence of Washington, giving the American League a tight 2-1 victory. 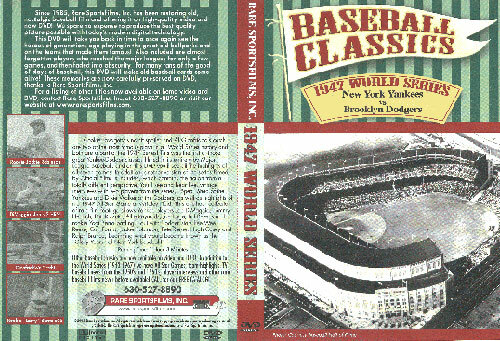 Game 1 at Yankee Stadium: Spec Shea vs Ralph Branca - 21 game winner Branca pitches perfect ball for four innings but the Yanks score all their runs in the five-run fifth, and beat the Dodgers in the opener 5-3. Dodger first baseman Jackie Robinson scores a run in his first W. S. game. Game 2 at Yankee Stadium: Allie Reynolds vs Vic Lombardi -Reynolds spaces nine hits and the Yanks break loose with 10 runs off four Dodger hurlers to rack up an easy 10-3 win. Homers are hit by Tommy Henrich of the Yanks and Dixie Walker for Brooklyn. Game 3 at Ebbets Field: Joe Hatten vs Bobo Newsom - At home in Ebbets Field, the Dodgers score six runs in the second, but need every one and hang on for a close 9-8 victory. Joe DiMaggio smashes out a two-run HR in the fifth. In the 7th young rookie Larry "Yogi" Berra (wearing his first uniform #35) hits the first pinch homer in World Series history. Game 4 at Ebbets Field: Harry Taylor vs Bill Bevens - This is the famous game they still talk about: With a 2-1 lead and a no-hit game with two out in the ninth, Bill Bevens faces Cookie Lavagetto, batting for Eddie Stanky. Lavagetto gets the most-remembered hit of his career, a double which drives in two runs and wins a 3-2 game for Brooklyn! With one out to go, Bevens not only loses his no-hitter, but the game as well! One of the most famous events in W.S. history! Game 5 at Ebbets Field: Spec Shea vs Rex Barney - Despite the heartbreak of the day before, the Yanks rebound with a 2-1 victory with help from Joe DiMaggio's second homer of the series. Game 6 at Yankee Stadium: Vic Lombardi vs Allie Reynolds - The largest World Series crowd in Yankee Stadium history (74,065) not only saw the Dodgers fight back to win 8-6, but also saw one of the all-time great game-saving catches in World Series history. In a see-saw game, the Bums jump out ahead 4-0, fall behind 5-4, then rally in the sixth with four runs to seemingly put the game away. But with New York trailing 8-5 in the sixth and two Yanks on base, Joe DiMaggio smashes a tremendous drive toward the left field bullpen, which looks like a game-tying homer. Little All Gionfriddo races back and makes a spectacular one-handed catch at the 415-foot maker, robbing DiMag of his third HR of the series. Watch Joe D., who almost never showed emotion, kick the dirt in disgust! Game 7 at Yankee Stadium: Spec Shea vs Hal Gregg - Despite scoring two runs in the second and chasing Shea, who had already beaten them twice in the series, the Dodgers can't do anything against ace Yank fireman Joe Page, who shuts down the Dodgers with one hit and no runs over the final five innings. Meanwhile, the Yanks score in four different innings and beat the Dodgers 5-2 to win the World Championship.